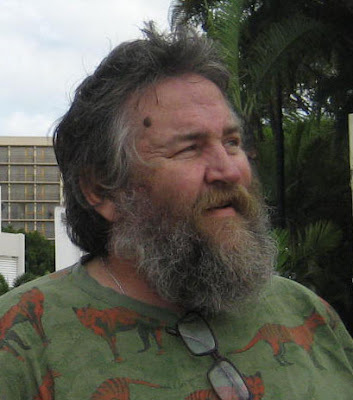 Veteran Cairns community campaigner, political activist, and CairnsBlog columnist, Bryan Law, underwent open heart surgery in Brisbane early on Friday morning. He was down there to see a specialist and to schedule his operation in March next year. However it was deemed necessary to go ahead immediately. He had three Coronary Arterial bypass grafts, in a process that took over four hours. A team of nine specialists looked after Bryan. "I'm still here," he told CairnsBlog this evening. "They've given me a 90% chance of surviving 10 years, so that's good I suppose." Bryan said how he still felt sore and still weak after Friday's mammoth surgery. Since the late 1980's, Bryan Law has been at the forefront of local political debate, on numerous issues that often don't get the attention they deserve in mainstream media. He campaigned over the building of SkyRail, the Daintree and many anti-war demonstrations. In 2004, he ran for Mayor of Cairns as an independent against Kevin Byrne and Val Schier. He took 6% of the vote, proving an important vote splitter. In late 2005, along with three others, Bryan Law breached a perimeter fence to conduct a citizen's inspection of the US spy base Pine Gap in the Northern Territory. The four were acquitted of charges under the Special Defence Undertakings Act 1952 earlier this year. During the last six months, Bryan led a civil disobedience direct action campaign. He master-minded several protests to draw public attention at the Labor State Government's decision to demolish the historic Cairns Yacht Club building on the Cairns waterfront. He was arrested three times during the campaign. "We achieved some significant mileage and exposed the government's inaction and inability to listen to the people," Bryan says. Bryan is hoping to return to Cairns at the end of the week, where he has been advised to take it slowly to recover. "For the next few weeks, all I want Margaret to say is 'yes dear, of course dear, I'll do that'," Bryan said, joking about his partner. You can send your wishes to Bryan via email. Makes one feel real good about paying taxes doesn't it? Oh well ... off to work I go. I have s strong urge to be able to say "I told you so", regarding several significant poltical matters, in a few decades time. It would really annoy me if you're not around to hear it, so get better fast! Regardless if you like or loathe Bryan law, we need fighters like him. Bryan represents hundreds who copmplain and often don't get off their arse to express how they feel. I watched Law run for Mayor in 2004, and observed him then. I heard the slander and cheap shots from the right wingers about him, but decided to make up my own mind about who he was and what he stood for. He is an articulate man and writes great prose with passion. Bryan's contribution is truely significant to our local community and it's evolution as a politcially active and engaged society. There's an old saying that those who idly sit by have little to complain about. You could not accuse Bryan of that. I read what he wrote on CairnsBlog a few weeks ago about meeting Val (in response to Paul Matthews' letter) and his points were not only relavant, but he has a genuine conviction for the cause of democracy. Shame on Val Schier for not at least listening to and respecting his input. She has become nothing more the an administratior on $160,000 pa. What a great shame that we can't feel proud about her acession to this office of Mayor. She would do wonders to embrace people like Bryan and engage numerous individuuals into a 'thinktank'. People like Bryan will always triumph above such bureaucracy and mediocre leadership. And for the record, I've never met Bryan Law, and often don't have the same views as he expressess. I simply know that he has a just and proper role in local debate. Oh, and best wishes from our family to yours Bryan! Good to hear Bryan's got through the surgery OK. It would be terrible to lose him. He's one of Cairns Living Civic Treasures. Who else is going to impersonate Desley? Get very well slowly & surely. A prediction Bryan - I can see a lot of yummy salads in your future.